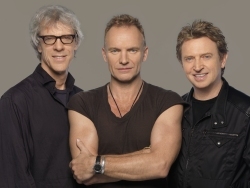 Sting | News | Last few tickets still available for the Fan Club show for thepolicetour.com club members! Some tickets remain for the exclusive Fan Club gig in Vancouver on May 27, ahead of the tour opening show on Monday, May 28. Tickets are priced at the bargain figure of $50 each although you must be a fan club member in order to purchase them. Existing Police fan club members can ordered via https://tickets.thepolicetour.com/ or the tickets can be ordered from www.ticketmaster.ca/ where the cost of fan club membership will be added to your ticket order. Since we know The Police Tour Fan Club members are by far the band's biggest supporters (and have waited over 23 years to see the band! ), this is the band's way of saying thank you to the fan club for their loyalty and patience. This will be an extremely special show as only certain areas of GM Place will be sold, so the venue will be kept as intimate as possible. The only way that you can buy tickets for this exclusive show is through ThePoliceTour.com and by being a member of the Fan Club. Tickets will NOT go on public sale for this show. - The 2 tickets DO NOT count toward a member's presale code count... so even if you have already purchased tickets for another date, feel free to buy! - All tickets will be Will Call only and need to be picked up in person at the venue on the day of the show beginning at 12 noon (the location of will-call will be provided closer to the show date). Don't miss this once-in-a-lifetime opportunity to catch The Police gearing up to take on the world and performing for their biggest fans! You must be a member to participate in this presale. Our fan club sale system will generate your fan club sale passcode for you when the show goes live. You will not get a passcode before the fan club sales start. We strongly advise that you carefully review the instructions on how to participate in the fan club presales before they start. View these instructions at Ticket Presale Guidance. To purchase your tickets, please visit the ThePoliceTour.com Tickets page. Tickets for this show are strong in terms of both quantity and quality and we hope that as many fan club members as possible get seats. However, as this is a fan club exclusive, intimate show, tickets are expected to sell out very quickly. Also, The Police Tour Fan Club is not just a ticket club. Joining the Fan Club is not a promise that you will be able to get tickets to a show. What does 'Local Time' mean? For example: if we say "presales start at 1pm Local Time" and there is a presale in NY, it will happen at 1pm EST and if there is a presale in LA, that presale will start 1pm PST. If you are interested in a presale that is outside your timezone, please make sure to adjust for any time zone difference.